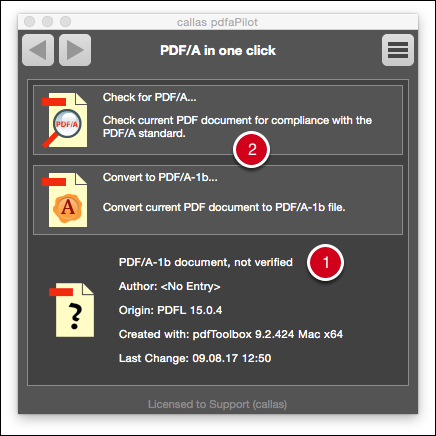 Validating and creating PDF/A files is incredibly easy with pdfaPilot. 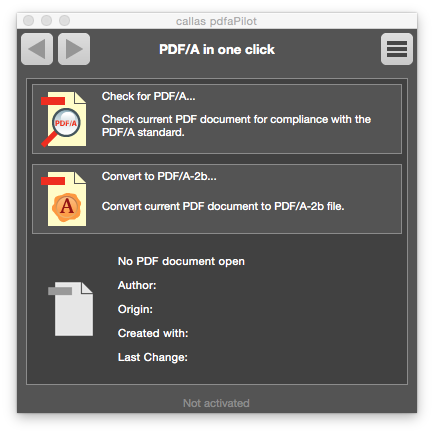 Open the “PDF/A in one click” dialog to do exactly what it says: convert files to PDF/A or validate them with a single click. “PDF/A in one click” is opened differently depending on whether you are using pdfaPilot as a standalone solution or as an Acrobat plug-in. 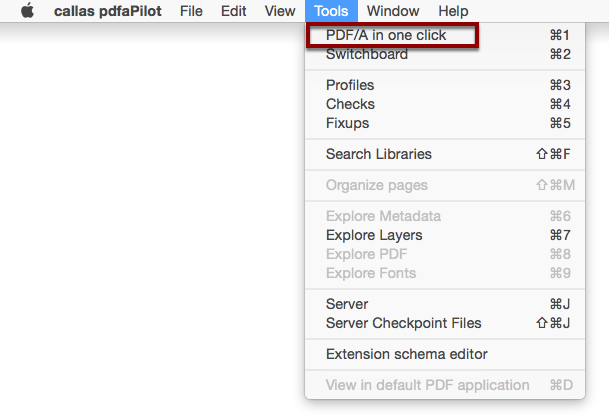 You can open PDF/A in one click by opening Tools > PDF/A in one click in the menu. Alternately, you can use the keyboard shortcut Cmd+3. In Acrobat, you can access pdfaPilot’s PDF/A in one click function via Plug-Ins > pdfaPilot <version number> in the menu. 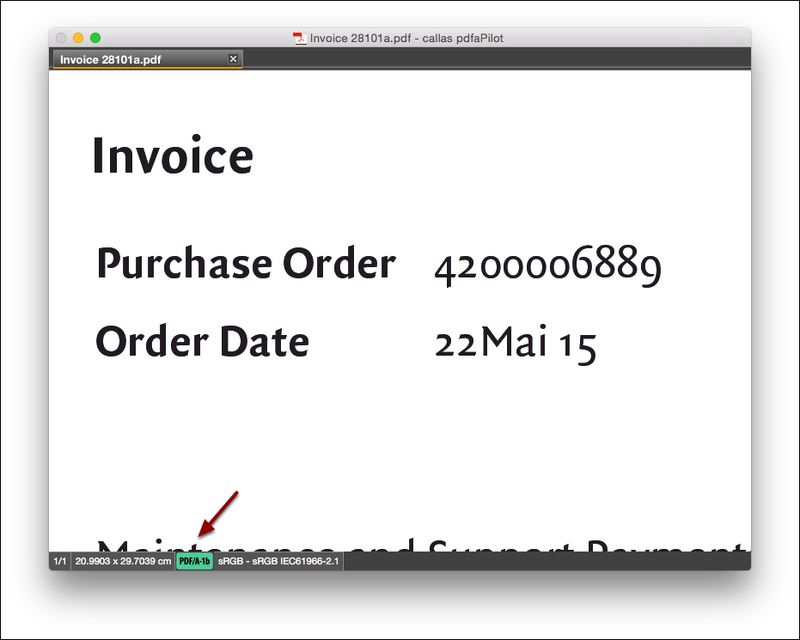 The PDF/A in one click window will then be displayed. 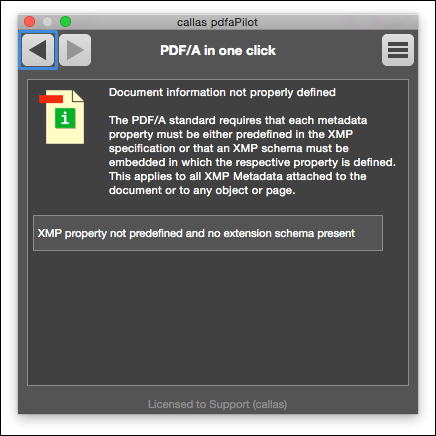 Open a PDF file in pdfaPilot. 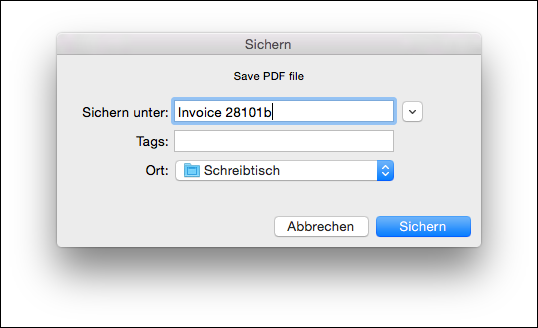 At the bottom of the file window, you will immediately be shown a notification if the current PDF document is a PDF/A document. Here, pdfaPilot is reporting that the PDF document has been identified as a PDF/A-1b file. The following test will inspect the file thoroughly. 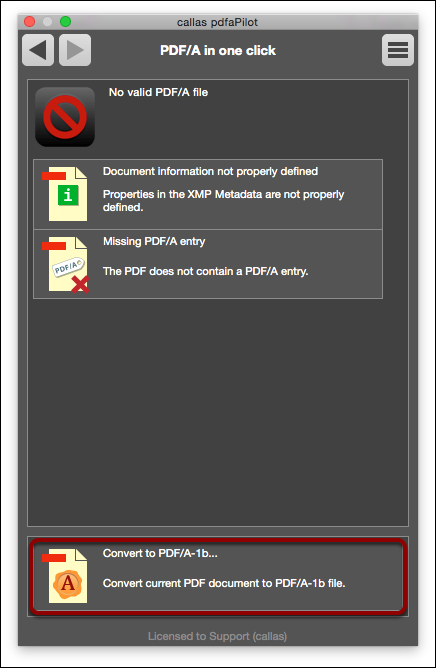 The lower section of the dialog shows general file information as well as its PDF/A status. The current file has not yet been verified. If the PDF file is checked and found to be PDF/A-compliant, pdfaPilot will report this in the window that opens. A green check mark indicates that the PDF/A check returned a positive result. pdfaPilot will also inform you of the document’s PDF/A level. If the file features any properties which are not permitted under PDF/A, these will be indicated in a brief overview at the end of the validation process. Click on an entry in the list to see the details of the problems that have been found. These types of PDF files can usually be converted to PDF/A. The preset level is PDF/A-b. This can be changed in the Preferences menu. Most problems can be easily solved by clicking on the Convert to PDF/A-1b button towards the bottom of the window. 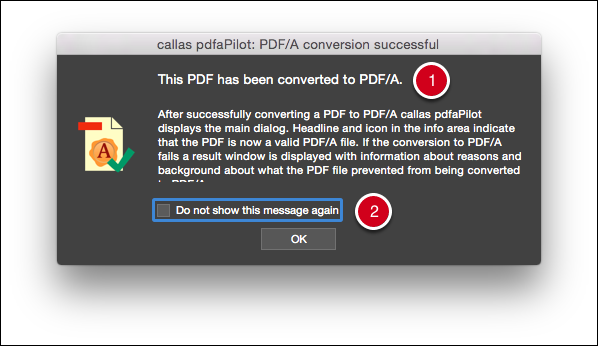 A dialog will appear, allowing you to enter a name and location for the newly created PDF file. A message will appear informing you that the file was successfully converted. You can check the box at the bottom to prevent the message from being shown again.